“Rococo Hut” looks like Marie Antoinette’s farm estate “Petit Trianon” in Versailles. 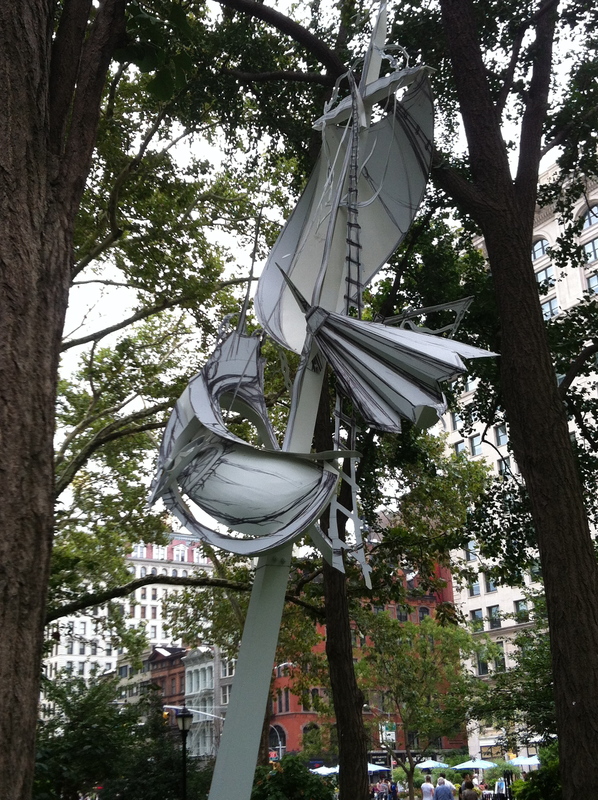 “Cliff House” is one of three aluminum sculptures placed in Madison Square Park, and looks as if it belongs on the set of an opera! 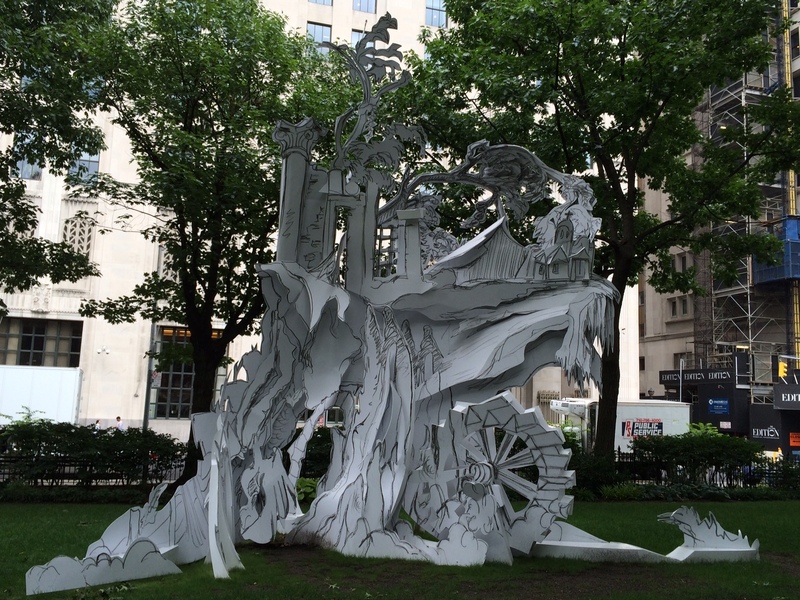 While in New York last month I had an opportunity to partake in a quaint picnic lunch in Madison Square Park and the chance to see sculptor Rachel Feinstein’s first public exhibition entitled “Folly”, which ends September 7th. Upon entering the park you see the first of three surreal, extremely large structures that were architecturally popular in the eighteenth and nineteenth centuries. These whimsical pieces have a white powdered coating that appear stark against the lush green backdrop of trees, and look as if they were taken from the set of “Pirates of the Caribbean” or one’s favorite “Fairy-Tale. “Flying Ship” looks as if it were plucked from the Pirates of the Caribbean set! These sculptures made of aluminum embrace many venues such as the theater, ballet, history, and yes the arts. Strategically placed so, one has the chance to peruse throughout the grounds feasting their eyes while enjoying lunch. 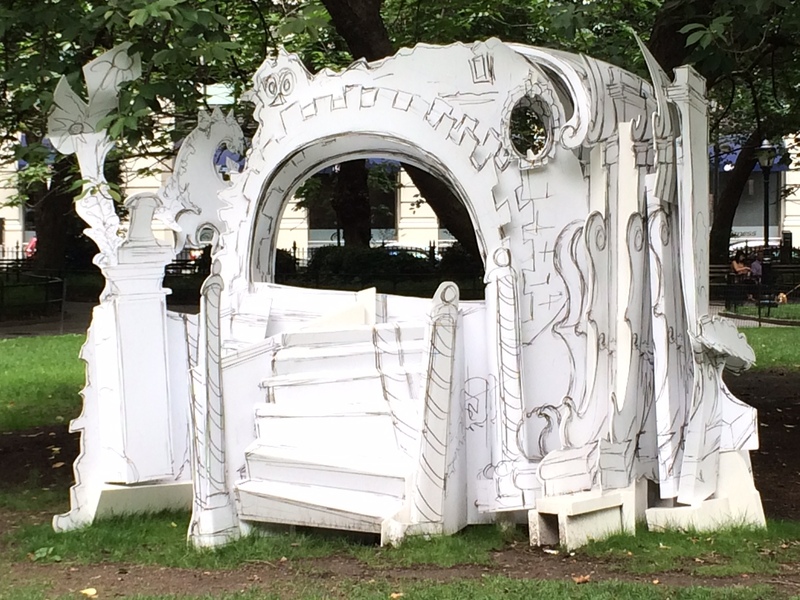 Note: Rachel Feinstein’s: Folly” runs through Sept. 7 at Madison Square Park, between Fifth and Madison Avenues and 23rd and 26th Streets.